101 Optimal Life Foods is written by nutritionist David Grotto who is also the author of 101 Foods That Can Save Your Life. In this book Grotto addresses 30 common health conditions and outlines how you can introduce healing foods to your diet through delicious, easy-to-prepare recipes. In the first part of 101 Optimal Life Foods, Grotto categorizes the 30 health problems into seven major health challenges and explains how to overcome them by selecting specific foods. In this section Grotto explains how foods rich in vitamin C and eggs can improve the appearance of your skin in conditions such as teenage acne and aging, damaged skin. Learn to improve your circulation and find relief from cold feet and hands through the catechins that are found in green tea. Grotto outlines how healing foods like salmon and mushrooms can sooth tired and aching muscles. This section also addresses migraine headaches and nerve pain. This section highlights foods to reduce stress (spinach), improve your sleep (bananas and lettuce) and enhance sexual performance (blueberries). Grotto addresses constipation, diarrhea, irritable bowel syndrome and urinary tract infections. Discover why passionfruit is good for your heart and how cinnamon can cure bad breath. Learn about the healing foods that can help to assist with the management of arthritis and build your bones such as prunes and onions. In this section foods are highlighted that improve eye health and prevent the risk of age-related macular degeneration such as pistachios, almonds, avocados and kiwi fruit. The second part of the book includes detailed meal plans for the specific health conditions as well as an extensive selection of recipes. The meal plans contain three meals and two snacks and provide about 2000 calories per day. Blueberries, raspberries, kiwi fruit, apples, bananas, mango, pomegranate, pears, passionfruit, lettuce, spinach, mushrooms, pistachios, almonds, walnuts, pecans, cranberries, cherries, avocado, beans, barley, oatmeal, wild rice, cocoa, yam, squash, eggs, salmon, shrimp, tilapia, salmon, chicken, yogurt, green tea, rosemary. 101 Optimal Life Foods does not include an exercise program, however, general suggestions are provided in relation to the 30 specific health conditions that are discussed. 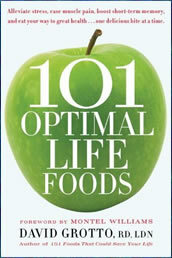 101 Optimal Life Foods retails at $16. Also available is 101 Foods That Could Save Your Life for $15. Emphasizes how dietary choices can have a positive effect on health. Information is based on scientific research. May assist with the management of a variety of common health conditions. Following the dietary suggestions may not completely alleviate the health conditions outlined. Does not contain an organized list of the 101 healing foods. 101 Optimal Life Foods will teach you how to prepare healthy meals that have the potential to result in improvements of a wide variety of common health challenges. It will appeal to those who enjoy cooking and are interested in living a healthy lifestyle by eating a diet rich in foods that promote healing.